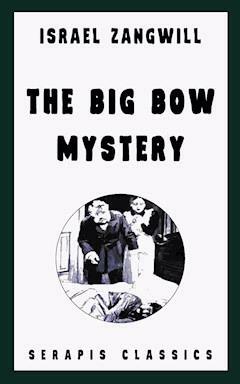 Written originally in 1892, The Big Bow Mystery is supposedly the earliest example of a full-length locked-room mystery. The action begins as one The Big Bow Mystery by Israel Zangwill wasn't the first locked room mystery ever published. That accolade goes to Edgar Allen Poe's short story, The Murders in the Rue Morgue in 1841. However the 1892 book is widely regarded as the first full length novel to feature a murder in an enclosed space where it appears there could be no possible escape for the killer. It's a story type which reached its height during the Golden Age of crime fiction, but is still much loved by authors and readers today. "Ay, knock your loudest," whispered the pale-faced woman. "You'll not wake him now." The gray mist had followed them through the street door, and hovered about the staircase, charging the air with a moist, sepulchral odor. "Locked and bolted," muttered Grodman, shaking the door afresh. "Burst it open," breathed the woman, trembling violently all over, and holding her hands before her as if to ward off the dreadful vision. Without another word, Grodman applied his shoulder to the door, and made a violent muscular effort. He had been an athlete in his time, and the sap was yet in him. The door creaked, little by little it began to give, the woodwork enclosing the bolt of the lock splintered, the panels bent upward, the large upper bolt tore off its iron staple; the door flew back with a crash. Grodman rushed in. "My God!" he cried. The woman shrieked. The sight was too terrible. Within a few hours the jubilant news-boys were shrieking "Horrible Suicide in Bow," and "The Star" poster added, for the satisfaction of those too poor to purchase: "A Philanthropist Cuts His Throat." But the newspapers were premature. Scotland Yard refused to prejudge the case despite the penny-a-liners. Several arrests were made, so that the later editions were compelled to soften "Suicide" into "Mystery." The people arrested were a nondescript collection of tramps. Most of them had committed other offenses for which the police had not arrested them. One bewildered-looking gentleman gave himself up (as if he were a riddle), but the police would have none of him, and restored him forthwith to his friends and keepers. The number of candidates for each new opening in Newgate is astonishing. The full significance of this tragedy of a noble young life cut short had hardly time to filter into the public mind, when a fresh sensation absorbed it. Tom Mortlake had been arrested the same day at Liverpool on suspicion of being concerned in the death of his fellow-lodger. The news fell like a bombshell upon a land in which Tom Mortlake's name was a household word. That the gifted artisan orator, who had never shrunk upon occasion from launching red rhetoric at Society, should actually have shed blood seemed too startling, especially as the blood shed was not blue, but the property of a lovable young middle-class idealist, who had now literally given his life to the Cause. But this supplementary sensation did not grow to a head, and everybody (save a few labor leaders) was relieved to hear that Tom had been released almost immediately, being merely subpoenaed to appear at the inquest. In an interview which he accorded to the representative of a Liverpool paper the same afternoon, he stated that he put his arrest down entirely to the enmity and rancor entertained toward him by the police throughout the country. He had come to Liverpool to trace the movements of a friend about whom he was very uneasy, and he was making anxious inquiries at the docks to discover at what times steamers left for America, when the detectives stationed there in accordance with instructions from headquarters had arrested him as a suspicious-looking character. "Though," said Tom, "they must very well have known my phiz, as I have been sketched and caricatured all over the shop. When I told them who I was they had the decency to let me go. They thought they'd scored off me enough, I reckon. Yes, it certainly is a strange coincidence that I might actually have had something to do with the poor fellow's death, which has cut me up as much as anybody; though if they had known I had just come from the 'scene of the crime,' and actually lived in the house, they would probably have—let me alone." He laughed sarcastically. "They are a queer lot of muddle-heads are the police. Their motto is, 'First catch your man, then cook the evidence.' If you're on the spot you're guilty because you're there, and if you're elsewhere you're guilty because you have gone away. Oh, I know them! If they could have seen their way to clap me in quod, they'd ha' done it. Lucky I know the number of the cabman who took me to Euston before five this morning." "If they clapped you in quod," the interviewer reported himself as facetiously observing, "the prisoners would be on strike in a week." "Yes, but there would be so many black-legs ready to take their places," Mortlake flashed back, "that I'm afraid it 'ould be no go. But do excuse me. I am so upset about my friend. I'm afraid he has left England, and I have to make inquiries; and now there's poor Constant gone—horrible! horrible! and I'm due in London at the inquest. I must really run away. Good-by. Tell your readers it's all a police grudge." "One last word, Mr. Mortlake, if you please. Is it true that you were billed to preside at a great meeting of clerks at St. James' Hall between one and two to-day to protest against the German invasion?" "Whew! so I had. But the beggars arrested me just before one, when I was going to wire, and then the news of poor Constant's end drove it out of my head. What a nuisance! Lord, how troubles do come together! Well, good-by, send me a copy of the paper."